Iomega, an EMC company (NYSE: EMC) and a global leader in data protection, today announced the new Iomega® StorCenter™ px12-450r Network Storage Array, multi-protocol networked data storage for small and medium business, remote office/branch office installations and distributed enterprises. The StorCenter px12-450r features the new Intel Xeon Processor E3-1200 v2 Product Family, 8GB RAM, improved user supportability and is ready for 4TB* hard disk drives (HDD) and 10 gigabit Ethernet (10GbE) networks. Additionally, the StorCenter px12-450r utilizes the latest version the EMC® LifeLine™ software, an advanced operating system that makes EMC’s enterprise class expertise and cloud capabilities available to a broad range of users. The new StorCenter px12-450r Network Storage Array is designed for advanced functions including dedupe, VDI, database and storage-based applications. Examples of emerging applications include video management systems (VMS) for surveillance and McAfee VirusScan Enterprise running natively on the storage (see companion Iomega new release issued today). The heart of the new StorCenter px12-450r is the new low-power Intel Xeon Processor E3-1200 v2, coupled with 8GB memory. The multicore processor excels at multi-threaded storage workloads like multi-LUN iSCSI and multi-client virtual desktop infrastructure (VDI). The 8GB memory assists those workloads and easily supports memory-intensive tasks like the Avamar source-based deduplicating agent, included with all Iomega StorCenter PX series storage products. The new StorCenter px12-450r is a ground-up redesign of Iomega’s previous top-of-the-line model, the StorCenter px12-350r. The StorCenter px12-450r is available in diskless and partially populated configurations, enabling users to start small in terms of storage capacity, or provide their own HDDs and grow as workloads and storage capacity dictate. The px12-450r is qualified with a broad range of 1TB, 2TB and 3TB consumer and Server Class Series HDDs, as well as upcoming 4TB HDDs. All product configurations and expansion drives for the px12-450r available from Iomega include Server Class Series ATA drives for the highest reliability. The new px12-450r also supports solid state drives (SSDs), ideal for large amounts of small block random I/O workloads such as virtualization and database. The px12-450r expands on the px12-350r’s user serviceability with a new mechanical design that makes the processor complex itself user replaceable by removing just two thumbscrews. All product configurations include disk drive trays to simplify capacity expansion – users just add HDDs. One of the key advantages of adopting leading edge technology like the new Intel Xeon Processor is that the StorCenter px12-450r can handle advanced workloads to increase the lifespan of the network storage array for end users. The multicore processor and 8GB memory are ready for the next generation of storage-based applications. The px12-450r includes 2 PCIe slots to further expand the px12-450r’s capabilities, particularly by adding I/O connectivity, like 10GbE when it becomes mainstream. Finally, the px12-450r is ready to support 4TB HDDs, expected in wide availability by the end of this year. The StorCenter px12-450r features two software enhancements that are well matched to its leading edge hardware complex. The px12-450r is the industry’s only sub $10K (IDC price bands 1&2) storage array to run the McAfee VirusScan Enterprise product natively on the storage. Also the px12-450r can run Linux applications created with Iomega’s LifeLine Software Development Kit (SDK). McAfee VirusScan Enterprise is an enterprise-class endpoint security product which runs natively on the px12-450r, no external server required. Enterprise-class threat scanning means 1) threat identification and remediation through McAfee’s global network and reach and 2) consistent features (e.g., scanning options) and behavior (e.g., management and reporting) with the rest of McAfee’s VirusScan family. McAfee VirusScan will be included on all Iomega PX series network storage products when it becomes available, expected in the second half of this year. Designed with world class EMC® enterprise storage technology, Iomega’s newest generation of StorCenter PX Server Class Series desktop and rackmount array products incorporates a new version of EMC® LifeLine™ software with advanced computing features as well as utilizing 1TB*, 2TB, 3TB and soon-to-be available 4TB server class SATA drives for higher reliability and continuous operation in critical business functions, such as “always on” video surveillance applications. 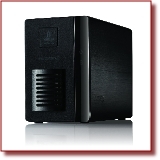 Storage capacities in the StorCenter PX series range from diskless models up to 48TB.